Well hello there…Happy Monday!! I think I’m still recuperating from the weekend – it was a busy one. 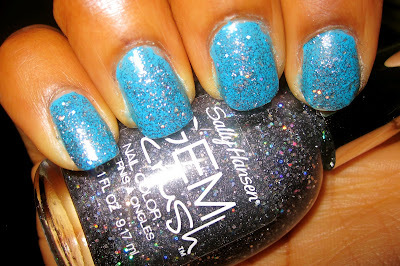 Anyway, for this week’s No-Chip Manicure I decided to try out another one of my Sally Hansen Gem Crush nail colors. Last Friday, I attended a black & white themed party so I wanted to make sure I chose the right color to make my nails pop. This sparkly grayish/black polish turned out to be perfect for not only for toning down my bright blue base but adding a bit of an accent as well. Love the glitters, so cute!